Today’s Sunday Sesh is brought to you by Cascade Pale Ale. This one was a light golden colour, and a little cloudy in the glass. Smells crisp and fresh, and went down well. Perfect for a stinking hot day on the Ridge. There was a slightly bitter aftertaste, but not too strong, and it didn’t stick around. I wouldn’t say no to this one if someone offered me one. So much to write about this week what with interesting happenings in Aussie cricket, as well as politics. But I want to start off with a rant – just a short one, I promise. 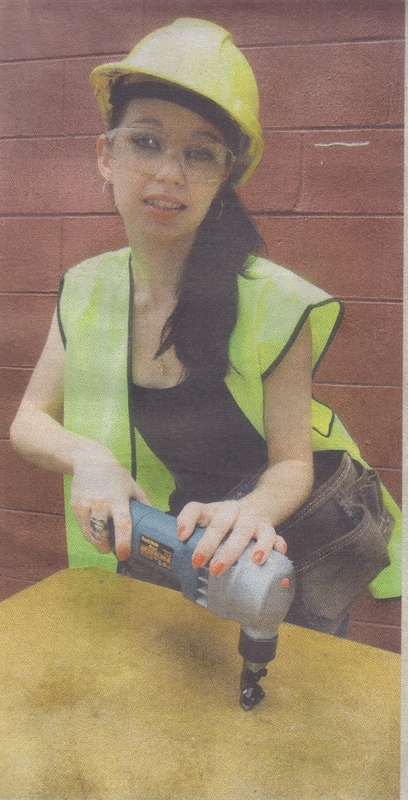 Every Saturday, there’s a little section in our local paper called “Tradie”. And every bloody weekend there’s a chick holding a tool. This isn’t just a gratuitous shot – it’s an ad for a tool they do a little speil on. They tell you what it is, what it’s used for, and who should use it. For example, this one’s called a “nibbler” (Hmm, on second thoughts, maybe the model is a good choice…) Tradies that could use it include “shed builders, roofers and sheet fabricators.” Does she look like a shed builder? Or a metal fabricator? So why does this annoy me so much? Well, I thought we’d grown out of this crap. It’s not Zoo magazine afterall. I’d be more impressed if they got a real tradie chick to show off the tools. At least she’d actually know how to use it. I mean, there’s no way she’d be able to use that tool with her nails. Plus, she’s holding it wrong. And she doesn’t even have any other tools in her tool belt. Look, I know blokes dig chicks holding tools provocatively, but seriously? In a little regional newspaper? The only thing missing here is a little bit more cleavage to get the boys salivating over their morning coffee. At least she’s got protection though I suppose. Those big tools can cause serious injuries if you’re not careful. Big news from Aussie cricket – we finally have a coach in South African Mickey Arthur. Lots of people are up in arms at the thought of a non-Aussie taking the reins, but you know what? That just tells me that our stocks of home-grown coaches are very, very low. Besides, Mickey Arthur plotted our downfall as the South African coach last time the Proteas were out here. He’s done some good things with WA, so I’m interested to see how he goes with rebuilding our team. I’m hoping he starts leaning on the older players to maybe drop back to state cricket to mentor the younger generation and elevate some of the younger players that have been toiling hard and waiting in the wings for someone to die. Thanks to a bag full of injuries from the tour of South Africa, we might get to see some of those young guns taking central stage against the Kiwis. Dave Warner looks to finally have his chance to prove he’s not just a 20-over wonder-boy (and put some pressure on Phil Hughes), and we have some new quicks looking to make their mark with Ben Cutting, Mitchell Starc and James Pattinson. It’s good to finally have some talent in our pace bowling stocks, but the big problem that still haunts us is injuries. And if the new coach can’t work out some way to keep our best on the park when they’re needed most, it’s going to be a long time before we can climb back up to No. 1. There is one burning question I have though – does having a South African coach mean that whenever the Proteas are playing we should respectfully cheer for them over their opposition, as long as it’s not the Aussies? And does that mean that the South Africans should be doing the same, except in reverse? What do you think? Happy for a South African to take the top job in Australian sport or not? And the other burning question – should Ricky Ponting call it a day and bow out gracefully in the second test in Hobart? That’s it from me for this Sunday’s Sesh.